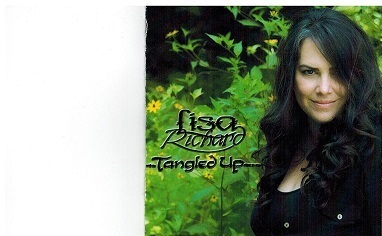 Lisa Richard, rock to blues artist from New Mills, New Brunswick, now living in Halifax, released her debutCD entitled, Tangled Up in 2017. Lisa was a top 10 CBC Searchlight Regional contest winner for original music. She is a singer/songwriterand is a rising star. Lisa is a talented singer and she treats her fans with amazing vocals. The CD Tangled Up contains 6 songs in which Lisa was a co-writer on 5 of the songs and the other is traditional song (Me and Bobby McGee by Kris Kristofferson). The words for all self written songs appear on the CD jacket. Lisa sings all lead vocals, harmonies and all instruments and Hal Bruce was producer and the CD was recorded, mixed and mastered at Denmark Productions Recording Studio and recorded by Dennis Field. Lisa does a superb job singing all songs with her amazing voice. She keeps one glued to all her songs and makes you want more of her singing at CD's end. This album should be a winner all the way and we can forsee award nominations and awards in the future says Atlantic Seabreeze and a well deserved 5 stars rating out of 5 for this album. For more information regarding Lisa and her music, refer to her website, address posted above.